Everyone’s blogs are reminding me that April is Adopt a Greyhound month. I have seen some great lists about why you should adopt a greyhound. 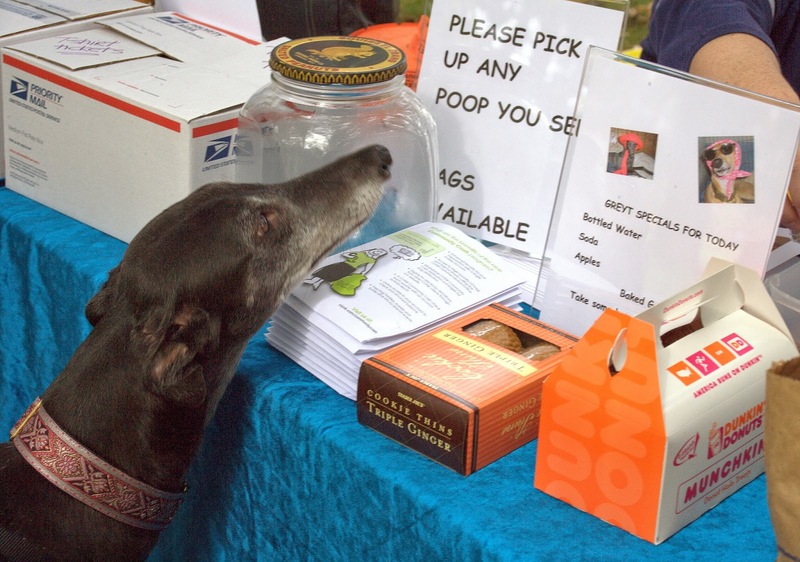 I think my favorite is posted on Greyhounds CAN Sit’s blog. I thought I’d take a moment to give you some reasons you should NOT adopt a greyhound. They aren’t for everyone. Greyhounds are special creatures with amazing souls. Some people don’t deserve them. So if you are one of the people listed below, consider a cat or perhaps a nice pair of shoes. 1. You hate to laugh. If you have no sense of humor and spend much of your time grumpy. Do not get a greyhound. a spouse either. But definitely do not get a greyhound. They don’t respect bathrooms, bedrooms or closed doors of any kind. Nothing is sacred. 3. You don’t like physical contact. The majority of greyhounds lean. They also like to curl up next to you. Or on you. Some must be touching you at almost all times. They are not called Velcro dogs for nothing. 4. You don’t believe that animals have souls. Greyhounds have soul spilling out their ears. And personality coming out of every other orifice. Get thee away from the hound if this is you. 5. You are fussy neat. This is probably true of any canine. Nose print art on all your windows, pounds of fur found in places you never would dream of, including most of your food, dog poop in your yard, vomit, urine, and drool. All of these things are yours with a greyhound. 6. You like to wear black or white. Forget it. If you consider yourself chic and black is the new black, don’t bother with a greyhound. You will never wear another item of clothing that doesn’t have some reminder of your black, white or multi-colored greyhound. 7. You hate dog smell. Well, wait a minute. You’d probably be all right on this one since greyhounds do not typically smell like dogs, even when wet. Still, if you hate dog smell, you really need to consider why you would get one of any kind. coats, bowls, beds, blankets, toys, a special greyhound sized car and all the other things you’ll buy for your hounds add up. In fact, never add it up if you want to stay in denial and thus, happy. 9. You are a super athlete looking for your next marathon partner. There certainly are cases of greyhounds that go jogging or hiking. Even a whippet that did well in disc dog competition. But 98% of greyhounds are couch potatoes. They’ll keep your spot on the couch warm. They’ll meet you at the door at the end of your run. But otherwise you’ll probably end up carrying them home about one 10th of a mile down the road. 10. You intend to reach the end of your life with a completely intact heart. When they leave you, and they ultimately must, they’ll take a giant chunk of your heart with them. The next one will help to fill the hole but it never fills in completely. At the end of your road there will be pieces missing. And it’s all in with greyhounds. There are no sort of half ways. Love it or leave it be. Great! all good reasons. But the one you missed, is, if you adopt one, you'll adopt another within a short period of time. Or worse, once you've joined the sighthound cult, you adopt a different breed of sighthound.. but definitely at least 2! All of these are true for whippets as well. This is so true, especially #10. I cannot imagine my life without a greyhound or two to share it with. Well, obviously, I'm not covered by your list, even though I'm still not sure I'm worthy to have a Greyhound! Ha! That comment absolutely proves you are not covered by my list! We are very sorry for your loss. There is nothing like the pain of that hole when they leave. Who are you kidding indeed! We all read tour blog and we know better! So many of my non greyhound friends are very critical of the fur, nose art, and etc, that I have been smashed into oblivion with their shaming me. This blogging with pet owners and greyhound owners has been such a blessing to me and my self esteem. Thanks for this list! It's true and so-o-o FUNNY! I enjoy all the hair and nose art, etc. It tends to keep the non lovers away, that's why they make coffee shops, if you have to see them go there. It's all about the dogs, if I had the room and the money ....... Greyhounds are not dogs, they are family, you don't like it, don't come around. My favorite was "special greyhound sized car" - YES! 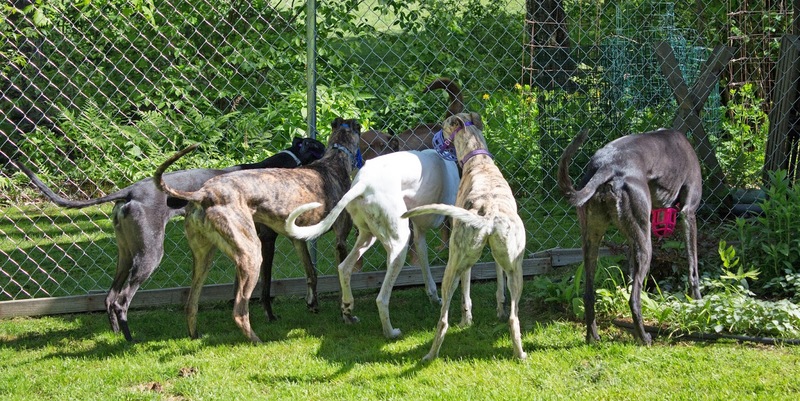 We are owned by a pack of 8 greyhounds, ranging from 18 months to 13 years. Cannot imagine a life without them. I would add that you have to be sociable, as you cannot take even one of them out without having to talk to at least 3 people about them on each trip out! Ahhhh. reading this as I ate my breakfast and smiling to myself, when a pointy nose pushed itself under my arm and stole my toast :) You forgot to add that your food will never be safe again - no matter how high the surface it's on! haha just noticed the time on my post - would like to add I'm in the UK, and I DO NOT eat breakfast at 3.39am! Simply AMAZING and soooo true!!!!!!! i dont have greyhounds but find that the post fits with whippets to! now have 3 and would hapily have a few more!!!! I don't have a greyhound have fallen in love with a friends and would LOVE to have one. Is a VW big enough or should I get a bigger car now? Start saving your pennies! But actually when I got my first two, we had a Kia Rio. And they both folded themselves up to fit together in the back seat very nicely. I did end up buying a nice greyhound sized car though! I have had 2 greyhounds in my VW Beetle with no problems. Now, sadly I only have one and he is very comfy in my V-Dub! That was meant to read *but have fallen in love... and *is a VW Tiguan big enough? Oh yeah... #2. We warn company to make SURE the bathroom door is closed tight, as our boy is VERY curious as to what goes on in there and WILL let himself in if he can. So true. Once you go greyhound you never go back. Have two and they are wonderful. Thank you for posting about your SLO experience! I think the more we all share, the better off the community is as a whole. How could I love your list any more? Hmmm . . . nope. I couldn't! We're on grey 2 & 3 now. Sadly, we lost our first due to a brain tumor or something brain related. In the end, it didn't matter exactly what, it was just time for her to go home where she could run again. She was such an excellent and happy runner . . . Aren't they all? Mmmm, how I miss her! She was our best couch potato ever, and would snuggle with me in bed for hours. Heaven will be full of greyhounds, don't you think? There was a reason the Egyptians worshipped Bastet. GREYHOUNDS ARE PEOPLE TOO !!! We are in Australia and adopted a greyhound, Patch. She is more than happy in the back (cargo area) of our Honda Jazz with her best Howie a Jack Russell. They have a deal going where Patch will stand and give a running commentary to Howie as to what is going on outside as we drive along. Howie happily stands up underneath her for the journey. He is happy so long as he gets out first! Greyhounds (Sight hounds in general if you think about it and research it) Were born and bred hundreds of years ago to run. They are hunters, bred to be lean and fast. Hence the cheetah like chest, with HUGE lungs for lots of oxygen while running. Greyhounds are still bred very carefully. This breed has the fewest Genetic faults of any of them. It is very rare for a Greyhound to have hip dyspepsia, or bad joints, or other genetic defects. The breed as a whole has been carefully managed and is Very Sound. I provide these loving talented creatures called Greyhounds with, SHEER UNADULTERATED JOY they desreve in my home. Well written article, so true!!! Adopting isn't an option for me as I own a rabbitry. So, instead I opted to do the night turn out an deliver the evening puppy snack at a grey hound kennel. I only have about 50 favorites & I get the one thing you adopters don't. I get to play with them from birth & watch them grow. I know their mommas well. Most of the litters are kept together until they eventually go up for adoption. Bark Back and Let Us Know Whats on Your Mind!